Meeting Saturday November 17, 2012: 1:00 P.M. to 5:00 P.M.
Come join us for a friendly poetry reading and discussion. Open to the public. Yoko DANNO is the author of several books and chapbooks of English poetry published in Japan and the USA. A collaborative work, a sleeping tiger dreams of manhattan: poetry, photographs and music by Danno, James C. Hopkins & Bernard Stoltz, translated from English, will be published (Mansards, Latvia) in September, 2012. Her English translation of “Songs and Stories of the Kojiki” was published by Ahadada Books (Toronto/Tokyo, 2008). Trane DeVORE’s work has appeared in Mirage, Crowd, First Intensity, Chain, Salt Hill, 26, The Electronic Poetry Review, Poetry Nippon, and many other venues. He has published two books of poetry “series/mnemonic” (1999) and “Dust Habit” (2005) both with Avec Books. He currently lives in Osaka and teaches at Osaka University. Jane JORITZ-NAKAGAWA is the author of seven volumes of poetry, most recently “Invisible City” (White Sky Ebooks, USA). Other 2012 publications include two chapbooks with quarter after press (USA), “flux of measure” and “season of flux,” and a poetry broadside, “blank notes,” with Country Valley Press (USA). She currently divides her time between Shizuoka and Nagano prefectures. Kiyoko OGAWA is a poet, translator and essayist, writing monthly essays on world literature for “Saku.” She has published five English and three Japanese books of poetry, as well as an academic monograph on T.S.Eliot. Her work has been included in anthologies and journals such as “other side river,” “Sunrise from Blue Thunder,” “Prairie Schooner,” and others. Goro TAKANO was born in the city of Hiroshima, and is assistant professor in the Faculty of Medicine at Saga University, where he teaches English and Japanese literature. He obtained his M.A. from the University of Tokyo (American Literature), and his Ph.D. from the University of Hawaii at Manoa (English/Creative Writing). His first novel, “With One More Step Ahead,” was published in by BlazeVOX (USA) in 2009. Atsusuke TANAKA works as a high school mathematics teacher in his hometown, Kyoto. In 1991, the prominent poet Makoto Oka identified him in the journal “Yuriika” as a major poetic voice of his generation. Tanaka has published seven volumes of poetry in Japanese, including an ongoing experimental series of poems called “The Wasteless Land” which draws inspiration and quotes from a wide array of sources ranging from pop music to classical Western and Japanese literature. 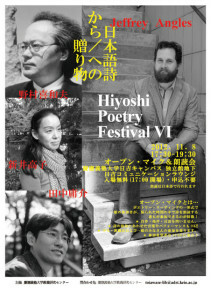 Poetry Kanto devotes itself to introducing Japanese poets and English-speaking poets to a wide audience at home in Japan and abroad. It aims to promote dialogue between Japan and the English-speaking world. Each issue features an in-depth look at poets from both sides of the cultural divide, setting up a blend of cultures and traditions unique among literary publications. The hope is for readers to step outside their limited cultural spheres and engage in cross-cultural dialogue for a rebirth at the crossroads of culture and imagination. Poetry Kanto contributor Jeffrey Angles. For schedule details and further information, click here. 10 and 11, 2012 at Doshisha Women's University in Kyoto, Japan. The Sixth Annual Japan Writers Conference will be in Kyoto this year at the Iwadegawa campus of Doshisha Women’s University. See the Doshisha Women’s University homepage here. This is the second time we’ve been there and it is a beautiful place. The dates are November 10 and 11, 2012. As always, there will be a lot to learn, a lot to talk about, and a lot to take home. Do you wonder what can Facebook and other social media can do for your writing career? Two presentations will look at this issue, along with another on getting a film option for your novel. There will be presentations on writing for children and young adults, along with a SCBWI gathering. Writing about the military, about Japan, sessions on traditional Japanese form and genre, editing, translation, and two publishing markets actively seeking your work are all part of the program, too. Presenters and participants will come from all over Japan, as well as from Canada, Australia, and Hong Kong. As in the past, this will be this will be a full and lively weekend.